Obsessed with keeping things simple. Seriously annoyed by lost and loose crayons. For those who know me, none of that is surprising at all. Well, maybe the crayon thing isn’t a well-known characteristic. I used to use pencil boxes in my classroom. Each summer I’d go out and buy 30 matching pencil boxes. In them I’d place 2 pencils, a pencil top eraser, large pink eraser, white board marker, scissors and a box of 24 count crayola markers. Then I spent the year annoyed with falling pencil boxes… spilling their contents all over the place. Things were always lost, misplaced, or simply abandoned on the floor. Crayon boxes were quickly smashed, ripped and destroyed or simply left empty in the box with crayons randomly thrown into the pencil box next to little pieces of trash that somehow always made its way into the boxes. Needless to say, I did not have a friendly attachment to those pencil boxes. The ONLY thing I liked about them was that they all matched. A few years ago I fondly thought back to how I handled classroom supplies in Kindergarten. Those fabulous communal supplies that never got wrecked. Shortly after that I was zipping, ok strolling, through Target and saw some fantastic caddies. The rest was history. This little change was the BEST change I have ever made. The mess just does not exist anymore. All supplies last way longer. Clean up takes seconds and desks can be cleared in moments. I label the crayons and the caddies are labeled (not shown here) with table numbers. Otherwise it’s community property. The only supply the kids have in their desks is their pencil. But, those crayons still find their way to the floor. Granted it isn’t as much of a problem as it was with the pencil boxes, but it’s still an issue. Some kiddos just throw their crayons into the blue tub without bothering to put them in their box. When that happens, the other children at their table wanting to keep things organized to keep their teacher oh so happy, tend to get rid of those crayons. This leads to me searching for crayons for some poor kiddo who desperately needs blue-green and apricot for his latest project. I like my kids to be in charge of the room as much as possible. I expect them to get what they need, when they need it – but crayon issues have been a challenge. So, a search for a solution was on. I went to Lowes and Home Depot and Wal-Mart and Target on a search for a hardware and craft organizer with 24 drawers that were all the same size. I never found one. All I could find were the ones with assorted sized drawers. Peeps, I buy everything from Amazon. EVERYTHING. But I never looked there for my lost and “I need a crayon” solution. Never. I have NO idea why. But a few days ago my husband needed a tool and asked me to check to see if Amazon had it. Amazon… tools? WHY had I never thought of it before? I don’t know. Anyhoo… I ordered his tool and a 24 drawer cabinet! This is the cabinet I purchased. This link is an affiliate link. My plan for this had always been that I would stock it with a few crayons at the beginning of the year and then we would add to it as lost crayons were found lying around and pull from it as needed. Actually not WE, the KIDDOS would be in control of their crayon situation. After laminating them, I cut them apart and organized the cards in an order that made sense to me. Then my husband said “Wouldn’t it be easier if they were in alphabetical order?” I caved after I took these pictures. It did make more sense. To complete it, I used a glue gun to put a few tiny beads of glue on the front of each drawer and then pressed the label into the glue. I LOVE how it turned out. My kiddos are in charge of their own crayon situation. I’m thrilled about that! I usually give my kiddos a new box of crayons 2-3 times a year. This year I will have them donate their gently used crayons to our crayon cubbies when I give them their new box. Kids taking ownership of the classroom and feeling in control and free to get what they need is a huge part of my classroom management. For the most part, the kids don’t like it when someone leaves an area of the room a mess or puts something away incorrectly. MOST of them will clean up and fix up anything they see out-of-place. They keep each other accountable and save me a ton of time. I love the pride they have in their classroom. This crayon solution is going to fit into our class management routine beautifully! 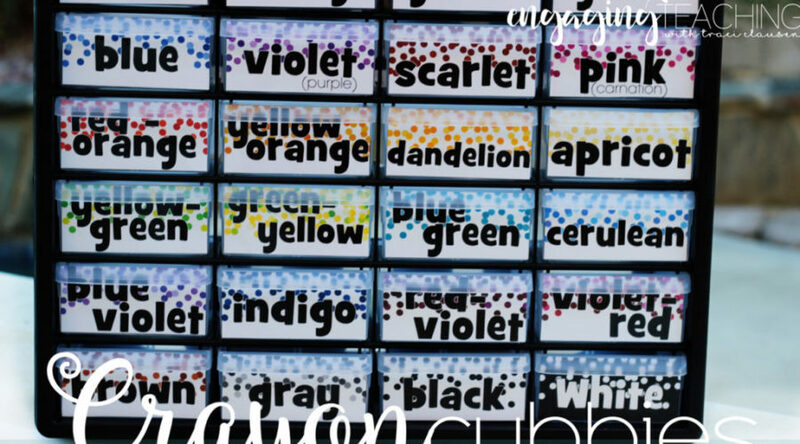 Grab the crayon cubbie labels in my store. So, how do you handle crayons in your room? Are you as neurotic about them as I am? Tracy! I love your new minimalist look. I usually read your blog in Feedly so I didn't realize you'd changed it up. CRAYONS! I switched to communal supplies last year and I LOVE it. It solves all those pesky problems you wrote about. I LOVE this idea, as I also have a bucket full of 'extra' crayons that kids can take one from if they lose one. Usually they end up digging way to the bottom looking for that perfect color (12 of which they just moved out of the way) and it's a way to kill time. I hate it! This is genius! Pure genius friend, pure genius! This makes our little obsessive compulsive hearts happy! It's so great for the kiddos to learn to be organized as well. LOVE it!